The Langtang-Gosainkunda region is a collection of Sherpa Valleys north of Kathmandu, close to the Tibetan border. The rough road now reaches as far as Dhunche, only a day’s drive from Kathmandu. Yet, despite this, Langtang remains a relatively less trekked area. Bill Tilman, a famous explorer and climbing partner of Eric Shipton, described Langtang as one of the world’s most beautiful valleys. We exit by passing the holy lake of Gosainkunda and crossing the Laurebina La (4100m). Here, you will have excellent view into Tibet and meet Hindu pilgrims before gradually dropping down the ridges and driving back to Kathmandu. 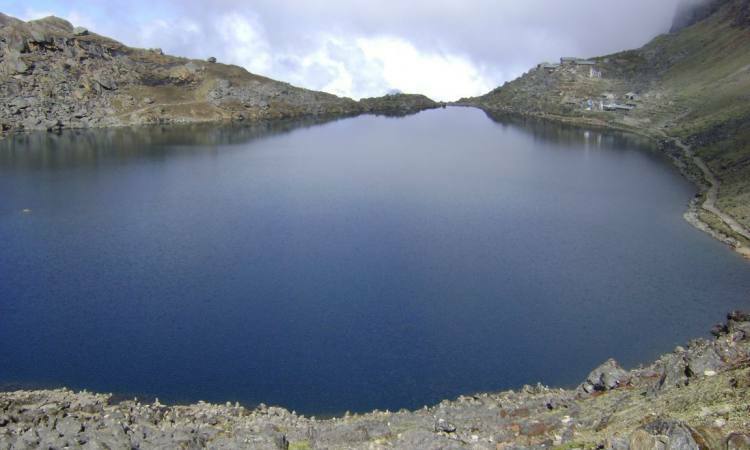 The Gosaindkunda Lake itself embarks the landmark high altitude natural water reservoir. The wilderness and the fear of unknown while trekking on the faded trail would give your adrenaline the test on perseverance and excitement. The sacred lake for both Hindu and Buddhist followers shows you the exemplary lesson on the religious harmony among Nepalese people. The lake itself symbolizes the sacrifice for the cause of goodness. The Lord Shiva once drank the poison extracted from the Sea in order to save mankind who were about to get vanished by the poison. He felt enormous pain and stroked on the hills of Gosaikunda eventually forming the source of water for the Lake. The water he drank made him neutralize the pain and poison. Therefore, the lake is the symbol of eternal peace and sacrifice. Every year thousands of tourist domestic and international pay visit to this sacred place. For the unique experience of religion, harmony and nature the Langtang trek is highly recommended. Day 02Drive from Kathmandu to Syabrubeshi(1460m).-6 Hours Wake up at early in the morning. Have a breakfast at the lodging. Appreciate seven our picturesque drive through Trishuli Valley with towns, stream, and mountains. You will become to at Syabrubeshi (1,420m) around 2 or 3 o'clock. Whatever remains of the day is free. Day 03Trek from Shabrubeshi to Lama Hotel(2560m).-8 Hours Today after breakfast your trek starts. You start your walking at your own pace and the trail ascends for around two hours through the forest followed by a climb of about an hour to reach Bamboo village (1,850m/6,068ft) where you'll stop for lunch. This forested path with well-stabilized trails and following the upstream and can be seen birds life around the bushes. Bee hives hanging on a cliff are another attraction for the visitors. From here you will again steeply climb through the bamboo forest to reach the Lama Hotel (2560m) where you'll rest and overnight at a local teahouse. Day 04Trek to Langtang (3307m) Duration: 5 hrsTrekking Trail follows Gumanech ok, Ghoda Tabela . After this the trail is slightly gradual up and beautiful view in the valley with the grazing Yaks. Langtang village is one of the local and old villages along this trekking route and the view from here is more mesmerising. Day 06Trek to chorkari and back Kyanjin Gompa (5050m) Duration: 7 hrs This is a day to rest and explore visit the monastery and the cheese factory, walk up the moraine to see the beautiful ice faces and ascend at Chorkari Ri (5050 meters) which is the highest point of this trek, directly behind the village, for a breath-taking panorama of the Langtang peak. Day 08 Lama Hotel - Thulo Syabru (2,235m/ 7,330ft) Duration: 5-6 hoursFirst trail down to river, pass the river and climb to Thulo Syabru. can the fascinating view of Langtang Himal and more. On the way of your trek you will pass through pine and Junipers forests. Day 09Thulo Syabru- Shin Gompa (3,330m) Duration: 3-5 hoursYou catch the main trail climbing up to Dimsa village and the trial continues less steeply, through rhododendron, hemlock and Oak forests to Shin Gumba. On the way of your trek you will see beautiful views of Langtang Himal and Langtang valley. Shin Gompa is another famous place for Cheese. Day 10Shin Gompa to Gosaikunda (4,300m) Duration: 5-6 hoursfirst part of the trail need climb up to Laurebinayak and the top of Laurebinayak gives you an awesome feeling. With a steep ascent all the way to Gosaikunda. You follow a rugged trail with dramatic views to the Manaslu range, Ganesh Himal range, Tibetan peaks and Langtang Lirung. On a clear day, even the Annapurna range can be seen rising up behind and to the north also across the valley is Langtang Lirung. You pass a few huts in the high pasture of Laurebinayak, cross a small ridge and have your first views of the holy lake of Gosaikunda. Day 13Malemchigaon to Tarkeghyang (2,590m) Duration: 5-7 hoursEnter a cultural destination it call Helambu Region, walk up to Tarkeghyang where you can enjoy with Sherpa culture with traditional village and monasteries. The stone houses are close together with narrow alleyways separating them. Day 14Tarkeghyang to Shermathang (2,610m) Duration: 3-4 hoursCross small forest with the view of beautiful village of Helambu region. The trail makes a sweep around the wide valley end between Parachin and the pretty Sharpa village of Gangyul. Day 15Shermathang- Melamchi Pul Bazaar –Kathmandu, 4 hrs hike and 3 hrs drive walk down to Melamchi Pul Bazaar along with a lot of Sherpa houses and take a car to Katmandu. Day 16Departure to final Destination (Farewell) We always feel very sad at this very juncture that our companion of trekking for the moment ends here and in the meantime we also feel relaxed that we were able to serve you with the best trekking experience that you ever get in your lifetime while trekking. We would leave no stone unturned to make your customers feel important and happy. We always take suggestions and encourage our valued customers to promote Nepal and Trekking in Nepal.